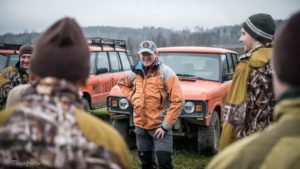 The ‘Pois Tieltä!’ Range Rover Safari offers unique driving experiences year-round for a company event or a team day. The Range Rover safari is driven in varied terrain and changing conditions. Routes run through forests, fields and some village roads as well. The safari is driven in Lohja, less than one hour’s drive from Helsinki. In conjunction with the driving event, you can also book sauna facilities, dining as well as meeting rooms with us. The team size for a Range Rover safari is from four to sixty. You can take part in the Range Rover safari even if you have not driven a four-wheel drive before, or driven on off-road terrain. The event includes orientation and training for a safe, comfortable experience for first-timers. The traditional Range Rover safari is driven with orange Range Rovers. In addition, two Range Rover Discoveries are used. 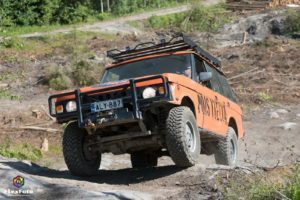 The Range Rovers are equipped for the demanding off-road drive and have a raised platform, an armoured base, off-road tyres, winches and safety bars. Our experienced instructors will help you get started and then you will have the chance to experience the thrill of off-road driving. The Range Rover safari routes vary from soft swamps to steep cliffs, from fallows to varied forest. The difference in height is at most fifty metres. The change of the seasons adds its own interesting elements to the experience. The slippery iciness or abundant snow in winter is quite different from the muddy conditions during autumn and spring. Before driving, we always go through the Range Rover’s driving techniques and safety issues. At the same time, you will get acquainted with the Range Rover’s controls and the use of radio telephones. They are used to keep in contact with the instructor and team during the ride. At first, you get used to the vehicle in easy terrain and then you gradually move to more demanding terrains. During the Range Rover safari, our staff ensures safety by providing guidance, but clients will be driving themselves. ‘Pois Tieltä!’ provides the appropriate gear for the safari trip! Design an unforgettable business event, team day or recreational outing with us. Together with the Range Rover safari you can order dining and sauna, campfire coffee and grill sausages. 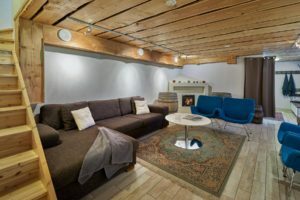 Also ask about meeting facilities, accommodation or transportation to the terrain. We plan your off-road event together with you, according to your team’s wishes. The team size normally ranges from four to sixty.